Poland's President Bronislaw Komorowski has signed a resolution approving the organization of a joint Lithuanian-Polish-Ukrainian brigade, whose creation has been in the works since 2007. When brought to full operation in 2017, the brigade is set to constitute 4,500 servicemen. They will operate separately from the three countries' respective militaries, but will take part in NATO exercises and missions. Preliminary drills are scheduled for later this year. The brigade will be stationed at its headquarters in Libulin, Poland. So far, it only houses 250 servicemen and 50 command staff contributed by the Polish military. The joint force was discussed as far back as 2007, but the agreement to create it was signed by the three countries' defense ministers in September 2014, in response to the Ukrainian crisis and what they call Russian aggression. Creating the joint force is “part of a wider plan … to support Ukraine, among others, in the area of modernization,” President Bronislaw Komorowski said as cited by Reuters. He also urged other European countries to spend more on defense. To that end, President Komorowski has suggested excluding defense spending from EU rules on budget deficit limits. This means that EU nations will be able to allocate more money to the military without fearing increased budget controls from Brussels. Komorowki's offer comes at a time of heightened tensions with Russia. 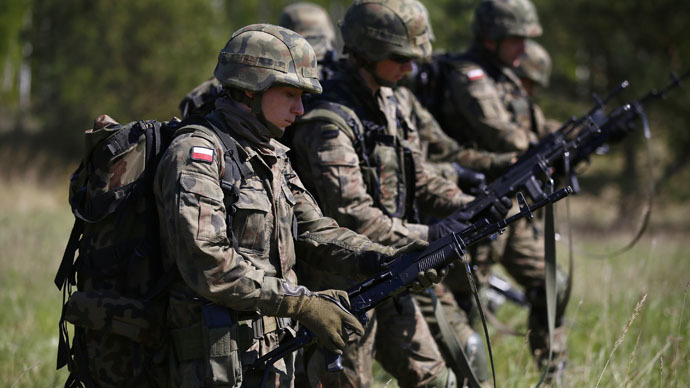 Poland now has the fifth-strongest army in the EU, and has ambitious plans to modernize it, spending about $36 billion until 2022. However, the Polish government is unhappy about a lack of similar eagerness in some of the other European nations, the Rzeczpospolita newspaper reports. While NATO is advising its member states to spend the maximum allowed of three percent of GDP on defense, most spending far less: Germany allocates 1.2 percent of its GDP, the Netherlands 1.3 percent and Spain under 1 percent. France is the only Western European country that is boosting defense spending. However, some Eastern European nations are increasing their military expenses citing what they call Russian aggression. Lithuania, for instance, wants to allocate twice as much on defense as last year.